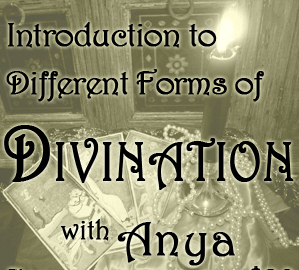 Introduction to Different Forms of Divination. Join us for this daytime workshop! This class is limited to 11 students. Are you drawn to divination and the idea of increasing your psychic abilities? Would you like to learn more about various modalities? Are you short on time or unsure of how to get started on such a project? Come and join us for this fun and comprehensive workshop. Palmistry, Tarot, Numerology, and Astrology. You will receive plentiful handouts and access immediate knowledge and skills. Books and tools will be available for your use during the workshop. Please feel welcome to bring your own items, plus water, pen & paper, and a cushion for your comfort. Anyais an International Claircognizant Psychic using tarot, Palmistry, Astrology, Angel Cards, Runes & Numerology as her tools. She has been a Professional Psychic for over 15 years. She has worked in New York, England, Ireland, Peru, Czech Republic, Hungary, Romania and throughout San Diego County.